Mushroom Observer: Observation 18368: Polyporus tuberaster (Jacq. ex Pers.) Fr. Observation 18368: Polyporus tuberaster (Jacq. ex Pers.) Fr. This centrally stalked polypore had a pale, rounded, cap with slightly darkened, zonate fibrils and a very spongy texture (like a Jahnoporus). Growing on wood, maybe acacia. About Polyporus tuberaster (Jacq. ex Pers.) Fr. someone searched all of my/all MO P. tuberaster obsies on MO yesterday, but only this one popped into my inbox for some reason, with Arora’s name proposal (but an old date). that this name was “re-proposed” today by Mycoamaranthus??! At least, that’s how it popped in my inbox. I thought that this was settled long ago. And to reiterate, this interesting mushroom grew on a stick, elevated far from the ground, and had no sclerotium attached. I have found these Polyporus species on sticks a couple of times. Guess that they have more than one way of making their livings, like most of us do. But fun to reread an old post where the myco-attittude is strong! Some things never change, eh?, even if those latin names might! Here is my page of P. tuberaster — all collections from California. and my “defense” was more towards getting at the truth of this collection…it was not on the ground, and not connected to an underground sclerotium. And please, would somebody comment on the damned spore size? I’m gonna get discouraged over this whole microscopy thing. Again. And Dimi, if you had mentioned that you thought it might be a tuberaster at the time of the meeting (what, nobody cared ! why do you think that I brought that mushroom to the meeting? ) when I still had the specimen, I would’ve literally dug deeper into that branch and solved this question once and for all, at least for this sighting, which is, what, 20 percent of what we’ve seen of this species over the past decade? let the reader (and writer) beware! kisses and accolades to all who go here. together we are thrashing our way to a semblance of mycological truth. Wow! I just saw all the comments. Darv: Spore size is given by Debbie V. right after (above) “Witchety Room for Wiggle Grubs”. Debbie V. – Not sure why you feel the need to defend yourself for not recognizing it. I thought that was what this site was for. I didn’t chide you for posting it as unidentified, I merely cited you. And what I said was, “If enough people could learn to recognize it and excavate thoroughly when they find one, we could easily determine how often the Calif. version arises from a sclerotium.” That isn’t about you, that’s about the problem, namely, that it’s not numerous enough in Calif. for any one interested person to make lots of collections, and very often it is found by people who don’t recognize it and thus don’t look for a sclerotium. Curecat — My comments were Snooty? Insulting? Belittling? Yikes! Strong words for a piece of fluff. Given what I know of this species’ frequency in California and the authors’frequency in Calif., their sample size can’t be huge and if it was two, then “always” could be two and “often” could be one, i.e., the “often” might not be as “often” as it sounds. That was my point, that their words had a distinct context which I tried to provide. As for Dimitar, he posts many beautiful photos of a standard that we should aspire to, so I couldn’t help but notice the pathetic nature of the sclerotium in his photo compared to that in poor pre-internet Arora’s tome and seized the opportunity to say so. It goes without saying that it isn’t Dimitar’s fault that the sclerotium wasn’t more presentable so how is it in any way a personal attack on him, or disrespectful? Or are you speaking on behalf of Polyporus tuberaster? Is Arora’s an outstandingly handsome example or is D.B.’s unusually underdeveloped? We don’t know. Or at least I don’t know. That was my point. No value judgment on Dimitar or Arora or anyone else, just on two very different-looking sclerotia. And while beauty and ugliness are not inherent, certain objects do appeal to human eyes more than others. Dimitar – No no no no, you’ve got it all wrong! Everyone is against ME! To Whom It May Have Offended — Been a strange evening. It was not my intent to create distraction & drama, I seem to have misjudged the audience. Scientists needn’t always speak in solemn, reverent, pedantic tones; in fact, they often don’t, and many of them tend to avoid those who always do. I neither enjoy offending people nor spending time explaining myself, so now I will … Cease and desist? Cease to exist? Cheerio. What is the length of the spores in the photo? Gilbertson uses spore length in his key. Okay cool, carry on. Just want to keep the discussion equitable. I’m sorry if i missed the joke or came off as offensive, Mycoamaranthus. If Dimitar took the comments as I did, the conversation might have gone from academic to an exchange of ad hominems. I’m coming in to this one kind of late, so I’ll leave the identity to you folks. Erin, thank you for defending me!! in the season, up to the Spring. point in just yapping away on insufficient diagnostic data. It was in jest. Mycoamaranthus has a well known gift for flavoring the often flat flavor of fungal philosophising. OK, just checked more online photos…pore shots and very similar cap shots does make mine look like tuberaster, and I’d imagine that it starts soft and toughens with age. I’d hope so, since I understand people actually eat this one. Sclerotium or not, i think that’s what I have here. Heck Gang, we’re all doing the best that we can in an imperfect world. Mycoamaranthus, speaking of syntax (i.e. "operative word there is “often” " ), why are you being snooty?? Is it necessary to repeatedly insult and belittle Dimitar’s efforts in documenting simply another-not necessarily pathetic- pattern of growth?? come off as exceedingly petty. It’s not like one of the types is necessarily better, although you may have a preference. And it isn’t as though the mushrooms one chances upon necessarily reflect upon the individual collector. Let us please be respectful, it is a matter of science. at the very top of a largish woodpile; no ground contact whatsoever. therefore, unless it was completely buried and invisible w/in the branch, there was no tuber. I also just did the microscopy on this guy; subcylindrical spores ranging from 10 × 5 microns to 13 × 6 microns. Photo attached. There are problems with G & R ‘s description. They cite it as “widespread in the northern boreal zone” including Canada but their range map only places it in Calif. & Ariz. They say “when growing on wood there is often a connection through the wood to an underground sclerotium.” The operative word there is “often” – it gives them wiggle room, meaning they could have observed a connection through wood as little as once. Maybe they would like to say that P. tuberaster always forms a sclerotium. Not a puny, pathetic one as in Dimitar’s photo which looks rather like a charred and mummified witchety grub, but a beautiful big one such as shown in MD plate 151. But they didn’t have the data to back it up. I don’t think they collected extensively in the Mediterranean oak woodland zone of central & southern Calif. where “P. decurrens” is most common, and even if they did it is difficult for one person to find many. It is usually found by various different people unaware of what it is (like Debbie V.), and thus not motivated to dig deeper. If enough people could learn to recognize it and excavate thoroughly when they find one, we could easily determine how often the Calif. version arises from a sclerotium, and which sclerotial condition (Arora’s big, handsome, well-proportioned, worthy-of-being-gift-wrapped versus Bojantchev’s gnarly, stunted, decrepit and scabrous) is to be regarded as exceptional and which as commonplace. This subject came up recently. This subject came up recently in some forums and for what it’s worth, here is the file of what I had written. Debbie, that’s only part of the story. Let’s be very precise here! Polyporus tuberaster CAN grow out of sclerotia and be terrestrial, which seems to be the typical case in our area and generally in the warmer climates. Accorrding to European sources, Polyporus tubersater IN EUROPE IS PREDOMINANTLY LIGNICULOUS SPECIES that DOES NOT grow from a scletoria. According to Gilbertson and Ryvarden in Polypores of NA, P. tuberaster normally grows out of a scelrotia, even when it appears ligniculous. But not always! And yes, I have seen both. They are not always easy to tell apart — squamosus and tuberaster — they can grow out of wood, although that squamosus tends to be a parasite mainly, while tuberaster works on the dead wood. Here is a photo of the sclerotia of our local P. tuberaster. Given the synonmy with P. decurrens, this is definitely P. tuberaster. This would have keyed out to P. decurrens in MD, but I jumped the gun and called it a rain-battered P. alveolaris. What is the new species concept, then? Is it broad enough to include both tuber-growing and lignicolous forms? Does the tuber ever form in wood? so, are you saying that there is a tuber buried in that branch somewhere? I saved a chunk of it, as well as the spore print, and i will attempt to confirm or deny these various IDs microscopically today. 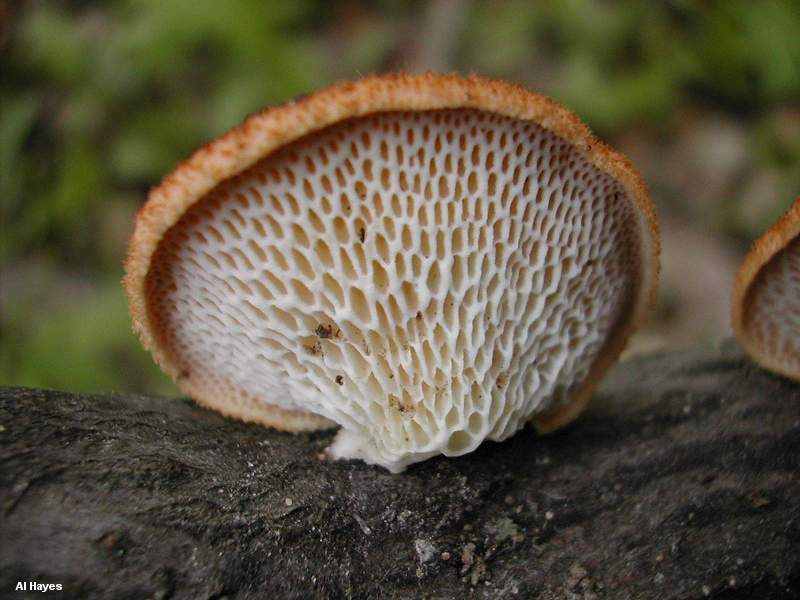 Most common California Polyporus with warm color shown, small fibrillose scales and easily visible pores. P. decurrens in MD but synonymized with P. tuberaster by Gilbertson/Ryvarden. you’ll see that the shape is a good match. Also, unless the pores on this were less than the recorded average range of 0.5-3mm wide (which seems unlikely, given that they are obviously not the tiny pores seen in most Polyporus), I’d say that P. alveolaris is a good fit. P. alveolaris is usually not stipitate, but mushroomexpert reports that it is occasionally rudimentarily central – stipitate, which allows the cap to become circular.